Today is International Chocolate Day. Well, actually, there are several dates that lay claim to this distinction, but I have chosen this one because it’s a slow day in the anniversary world. I could give you a whole song and dance about the history of chocolate, but I’m not going to. 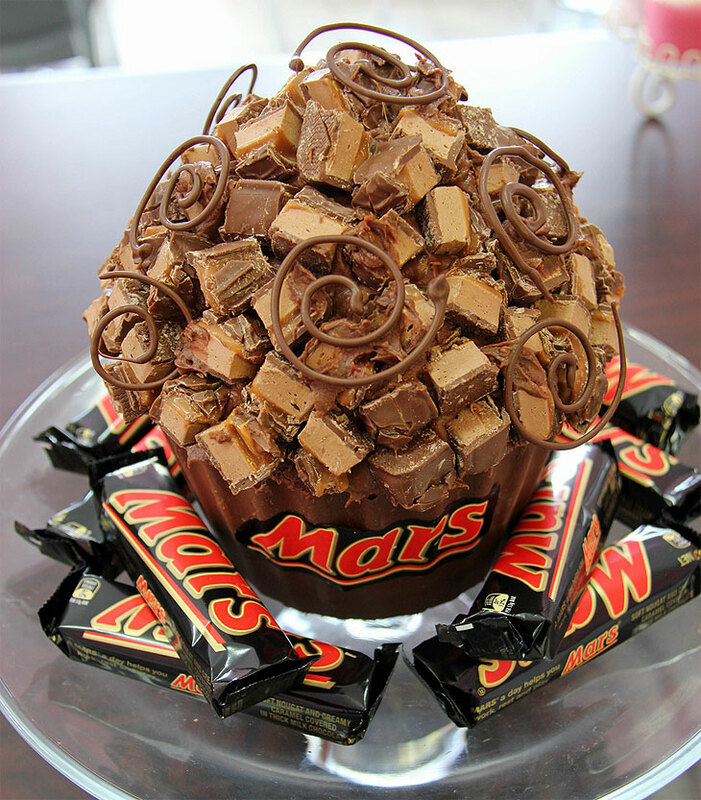 Instead I am going to focus on one single chocolate treat – the Mars Bar. The Mars Bar holds special personal significance for me. 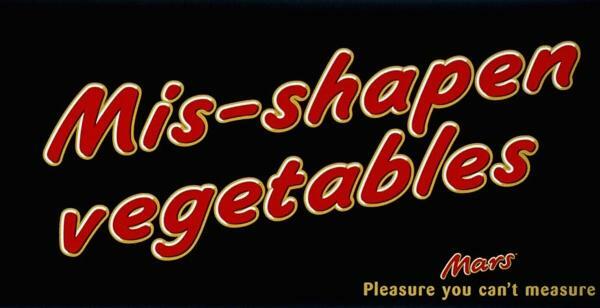 The Mars Bar was the first candy I remember tasting, and I became hooked instantly. On Saturdays my sisters and I used to go to the ABC cinema in Eastbourne, on the south coast of England, for the matinee, and our parents gave us a little extra money to buy a treat at Bernie’s sweet shop on the way. 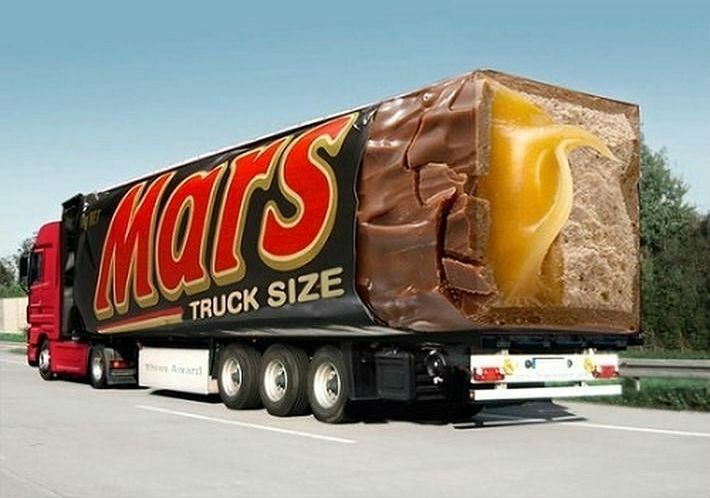 I ALWAYS got a Mars Bar. I think it was 6d. (six old pence). 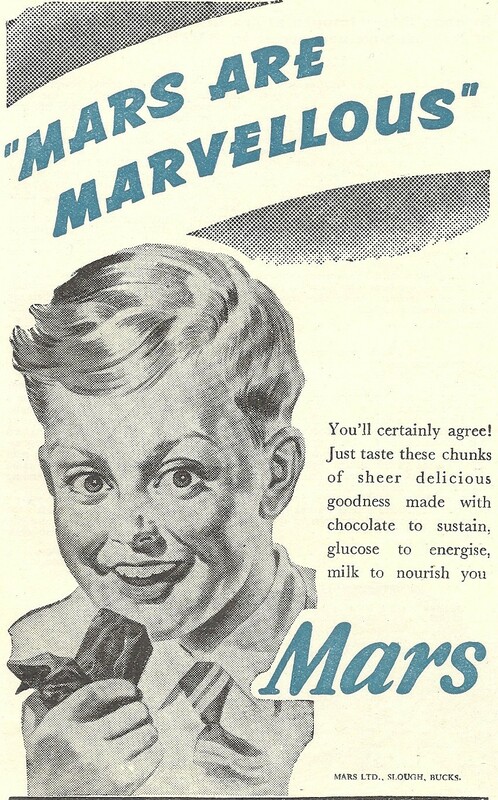 When I lived in Australia the Mars Bar continued to be a perennial favorite, so I was doubly delighted when the family returned to England in the mid-1960’s and we moved to Slough where Mars Bars were made. As a teenager I used to work in the summers on the Slough Trading Estate and bicycling past the Mars factory to and from work was a heavenly treat. The rest of the Estate was a grim wasteland, but the Mars factory was very clean and surrounded by a sweet cloud exuding the aroma of chocolate and nougat. In 1932, Forrest Mars, son of U.S. candy maker Frank C. Mars, rented a factory in Slough and with a staff of twelve people, began manufacturing a chocolate bar consisting of nougat and caramel covered in milk chocolate, modeled after his father’s Milky Way bar, which was already popular in the U.S. Apparently Forrest and his father had had a falling out, and so he went his own way (sort of). Today the basic recipe is unaltered but the size of the bar and the proportions of the main components have changed over the years. With minor variations, this version is sold worldwide, except for the U.S., and is packaged in a black wrapper with characteristic red and gold lettering. Most Mars bars sold in the U.K. are still made in Slough (yet one more reason Slough should not get the bad rap it does – click here for an amusing rebuttal of John Betjeman’s condescending poem “Slough”). 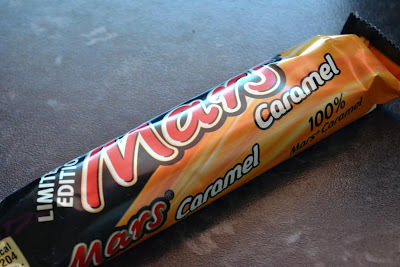 Although the basic Mars Bar is largely unaltered, limited-edition variants have appeared from time to time, mostly in Australia for some reason. There have also been limited edition wrappers, such as the England World Cup version, and, my favorite, a kit containing bars in blank wrappers with press on letters to make your own labels. 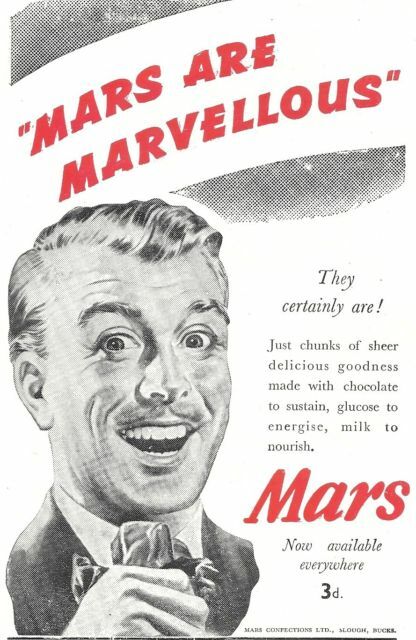 Mars has always tried to present the Mars Bar in advertizing as more than just a sweet treat, but as something wholesome. Mars was, therefore, not exactly delighted when fish and chip shops started dipping Mars Bars in batter and deep frying them. The end product is a gooey, partially melted bar with a crisp warm coating. 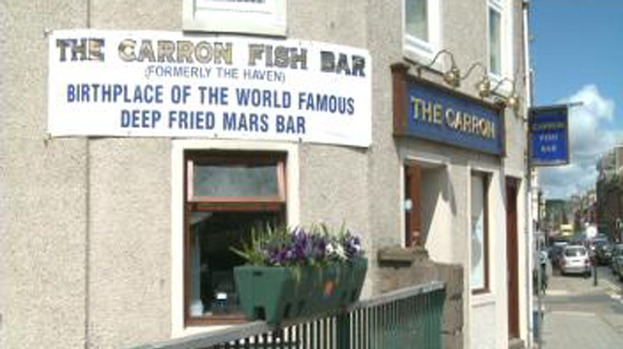 There’s no knowing who started this custom, but folklore has it that the deep-fried Mars Bar was first produced by the Carron Fish Bar in Stonehaven, in Aberdeenshire in 1995. 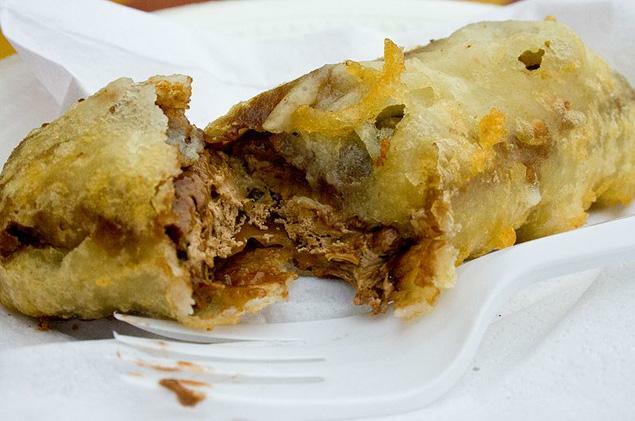 By 2004, a survey of 627 fish-and-chip shops in Scotland, published in The Lancet, showed that 22% sold deep fried Mars Bars. Average weekly sales were 23 bars, but 10 shops reported selling up to 200. Freezing Mars Bars also went through a fad stage, but they are rather brittle (I’ve tried it). What works better is to blend the bar into a mousse with cream and then freeze it. 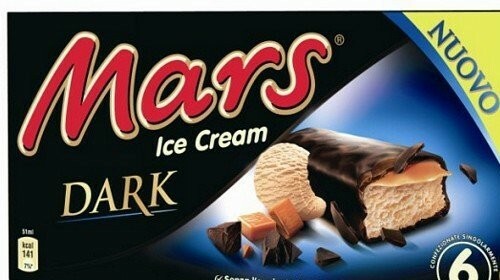 Mars responded to this fad with a Mars Ice Cream which is tasty, but not really like the original bar. 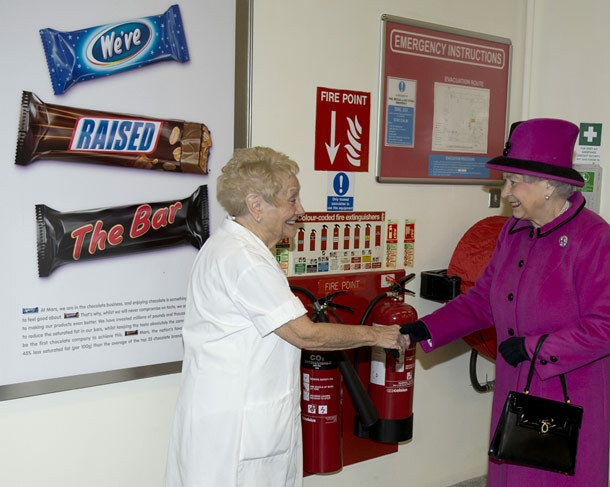 “Philip and the Queen visited Mars’s UK headquarters in Slough, Berks, where they met an 83-year-old worker who is the longest serving member of staff there. Audrey Cook began her career in the ‘stripping room’ where chocolate destined for Mars bars was cut into strips. 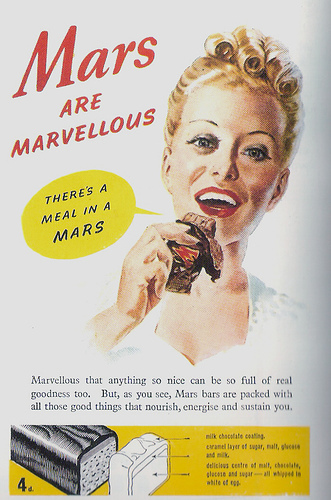 There are a number of recipes incorporating Mars Bars that are knocking around, but most of them seem to me to be overkill – “chop up some Mars Bars and put them in a dish with more chocolate and sugar . . .” etc. 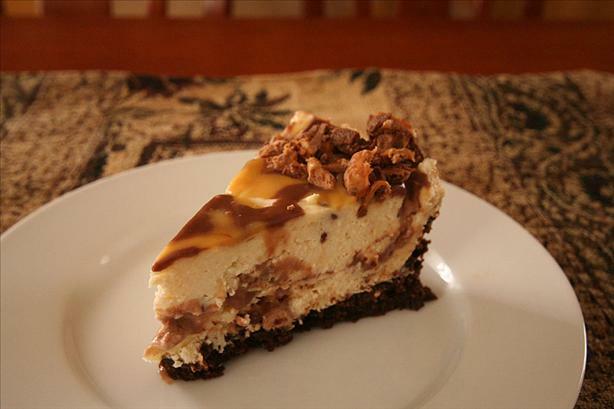 This recipe for Mars Bar cheesecake does, however, look like a winner. I am quoting the recipe directly from source (http://www.mydish.co.uk/user-recipe/35971/the-best-ever-mars-bar-cheesecake) because I have not tried it. The site assures us that it has been well tested. For U.S. cooks, use Graham crackers (chocolate coated or not) for the digestive biscuits. They are not the same, but they will work well enough. 1. For the base, squash or process biscuits until mixture resembles fine breadcrumbs. Add melted butter until just combined. Press biscuit mixture evenly over base (and side if preferred) of 20cm springform/loose bottomed tin. Refrigerate about 30 minutes. 2. Meanwhile make butterscotch sauce. Combine brown sugar, extra butter and 2 tablespoons of the cream in small saucepan. Stir over low heat, without boiling until sugar dissolves. 3. Make chocolate sauce. Combine chocolate and another 2 tablespoons of the cream in another small saucepan, stir over low heat until chocolate melts. 4. For the topping, beat cream cheese and caster sugar in medium bowl until smooth. Mix in remaining cream. (If using supermarket own cream cheese, electric whisk until reasonably stiff) Stir chopped Mars Bars. 5. Dollop half of the cream cheese mixture into crumb crust, drizzle half of the butterscotch and chocolate sauces over cream cheese mixture. Pull knife backwards and forwards through mixture a couple of times to create marbled effect. Repeat with remaining cream cheese mixture and sauces. Don’t worry too much how this goes as it is nice if there are a few globules of butterscotch or chocolate when you cut into the cheesecake later. 6. Cover cheesecake and refrigerate for 2-4 hours until set. 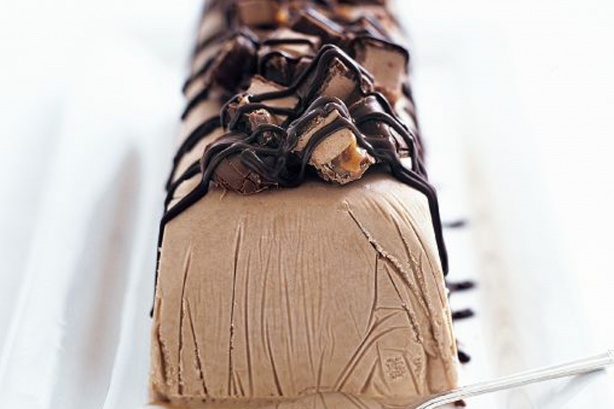 Decorate with sliced Mars Bar, crumbled flake or chocolate shavings. Your sister Anna (we used to work together ) told me about this blog and it is great, I work at the Haymill Centre on the Slough trading estate and the smell of chocolate has often drifted over the school to tempt us into wanting a Mars bar. Have you considered turning your efforts into a book ? 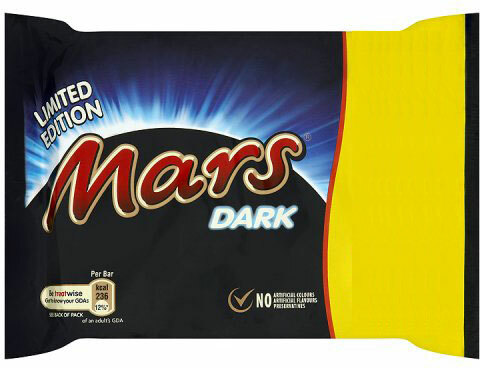 Are we going to see the ltd edition of dark chocolate Mars bars please ,I myself only eat dark chocolate and yours have been my favourite I always bought 6 at a time and store them to savour when they are taken of sale. Much more of a dark chocolate kinda guy too. There are 2 images of the dark choc on the site.